Yet again. Cool. I always enjoyed wolverine. However, I was an even bigger Gambit fan. Nobody does Gambit much. 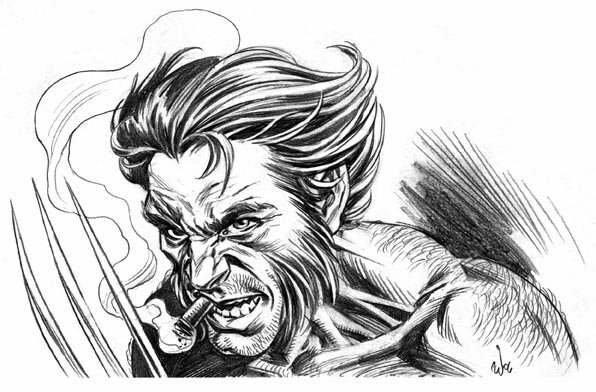 That's a very awesome Wolverine drawing!! Nice shading! I always enjoy Wolverine, and you've done a great job. I was also impressed by your video tutorial. Is it done on a tablet in Painter? Thanks for sharing. Great art work on your blog. Wolverine was my favorite one. Thanks for visiting my blog and for the tutorials. Angel- Thanks, Angel. The video was done with a tablet in Photoshop. I stumbled upon your blog and I'm glad I did. Great stuff. He's such a cool character! Thank's a lot for posting that "girl video". I'm trying to learn to paint in PS and find this extremely helpful. Just what I've been looking for:) It'll probably be a bit frustrading to try it out myself, cause you make it look so easy!!! Thanks, Hans. I'm glad it was helpful. Looking forward to seeing your PS experiments.